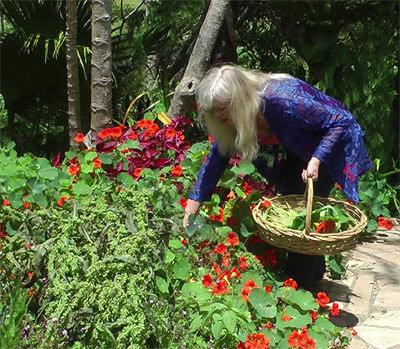 We have found Nasturtium to be a potent broad-spectrum antibiotic and healer which far surpasses any medical antibiotic in speed and effectiveness. It also has potent anti-cancer properties and is included in our C-mix anti-cancer tincture. Some clients who have used different antibiotics (prescribed to them from their Doctor) over a period of years (going from one course of antibiotics to another) had achieved no positive results with their healing. When they tried our natural antibiotic Nasturtium tincture their health condition cleared up quickly - often within days!. This has been the case over and over again with a broad range of health conditions. A favourite with bees, our Nasturtium plants are enveloped in a heart-lifting buzzing hum when the flowers come out in Spring - it is no surprise that honey and nasturtium share potent antibiotic properties - our clients have enjoyed many extraordinary outcomes using our Nasturtium tincture. A significant ingredient in many culinary dishes, Nasturtium is known to stimulate the appetite, promote digestion and metabolism. Nasturtium extract has sedative effects as well as outstanding antibiotic properties - potent and fast-acting - which are becoming increasingly valuable as synthetic antibiotics run out of steam. These properties make it an effective treatment for bacterial infections, especially those affecting the skin, urinary tract, respiratory and digestive systems. It is also an effective treatment for fungal infections, such as Candida. 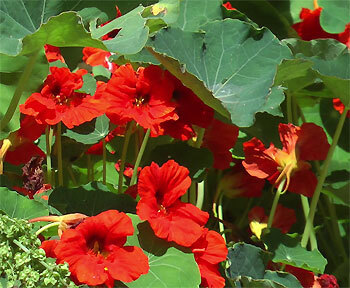 Nasturtium also has antitumor effects due to its high glucosinolates content, it can also help treat colds and the flu. The oils of the nasturtium plant contain carotenoids and flavionoids - compounds that have been shown to boost the immune system and protect against carcinogens. Nasturtium tincture has cardio-tonic and diuretic effects and helps lower cholesterol levels and treat diabetes. It is also good for treating liver disorders, kidney stones and skin diseases. Topical (external) uses include treating facial blotches, spots and blemishes and not last - definitely not least - a treatment for baldness, it can also be used as a chest poultice for bronchial congestion and coughs and as an excellent antiseptic in treatments of wounds and skin eruptions. Nasturtium tincture is antibiotic, antifungal, antiseptic, antiviral and antibacterial with excellent disinfectant properties. 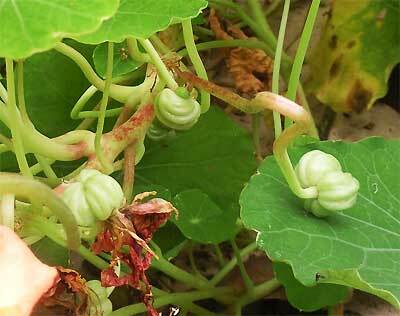 Nasturtium tea is useful for quenching thirst in feverish patients. We have found that the tincture we make is more concentrated, more potent and more convenient on many counts than the fresh herb which generally needs to be infused for optimum results. The seeds yield a high percentage of a drying oil that can be used in making paints, varnish etc. The growing plant attracts aphids away from other plants. Research indicates that aphids flying over plants with orange or yellow flowers do not stop, nor do they prey on plants growing next to or above the flowers. Here is an interesting piece from the Sydney Morning Herald about edible weeds featuring Nasturtium. At the other end of the spectrum the National Center for Biotechnology Information is acknowledging that Nasturtium contributes a potent antibiotic influence. A native of South and Central America, Nasturtiums were introduced into Europe in the 18th century where they were botanically named Tropaeolum after the Roman post-war trophies (the leaves resembling the shields and the flowers the blood-stained helmets of the vanquished). The common name, Nasturtium, comes from another plant, Water Cress (Nasturtium officinale), because they produce similar oils. Their ornamental value was also appreciated: flowers were used in nosegays, and planted to adorn trellises or cascade down stone walls. They became especially popular after being displayed in the palace flowerbeds of French king Louis XIV. Thomas Jefferson planted them in his vegetable garden at Monticello from at least 1774 onward. Interestingly, in one entry in his garden book, he categorized it as a fruit amongst others such as the tomato, indicating that he ate the pickled seeds. Most nasturtiums grown at this time were the tall, trailing orange variety. Over the course of the 19th century, breeders produced smaller, more compact types that mounded neatly into containers or formed a colorful, less sprawling edge to flower beds. Cultivars with cream and green variegated foliage appeared, as well as the vermilion-flowered Empress of India, with its strikingly contrasting blue-green leaves. 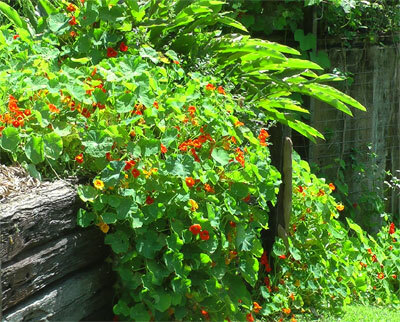 These developments paralleled the gradual shift in the perception of nasturtiums from edible and herbal garden mainstays to viewing them as ornamental landscape plants. Monet let large swaths ramble along a walk at Giverny. Nasturtium has been used for preventing scurvy since ancient times - a testament to it's vitamin C content. as a Juice - For common colds or urinary tract infection, 5mls of juice extracted from nasturtium leaves diluted in a 250ml of water drunk daily. as a Skin Wash - For bacterial infections and inflamed skin - rinse with an infusion of a cup of leaves steeped in two cups of boiling water for 15 minutes. as a Foot Bath - For fungal infections, such as athlete's foot, feet should be soaked for a half hour daily in a solution of two cups of leaves infused in four cups of boiling water for 20 minutes and then added to ten litres of warm water for two weeks. as a stimulant for Hair Growth - bathe the area with an infusion of a cup of leaves steeped in two cups of boiling water for 15 minutes - allow to cool before applying. Leaves can be eaten raw and have a hot watercress (mustard-like) flavour, very nice on its own or as a flavouring in mixed salads. The flowers are also edible and make a striking visual and tasty addition to the salad bowl, the flowers also have a hot watercress flavour and contain about 130mg vitamin C per 100g. Young seed pods can be consumed raw but are even hotter than the flowers or leaves which may deter some. They can also be harvested whilst immature and pickled for use as a caper substitute. The mature seed can be ground into a powder and used as a pepper substitute. 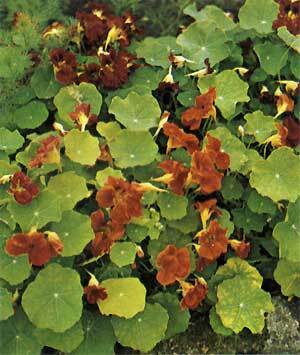 Nasturtium is a well-known garden ornamental which is a perennial although it is grown as an annual. It was introduced to Spain from Peru in the sixteenth century and reached Gerard in London in the 1590s; it was unknown in central Europe, however, until 1684 when Bewerning promoted it as a vegetable and medicine. The herb was known from its introduction as Nasturtium indicum or Nasturtium peruvianum; hence it became Nasturtium indicum or Indian Cress. The seed, flowers and leaves are now eaten for their spicy taste in salads, and the pickled flower buds provide the best substitute for capers. It is now rarely used medicinally, but it is still collected commercially in some countries. Description Somewhat succulent perennial, grown as an annual in cool climates. Climbing and twining to 3m tall - dwarf forms only reaching 40 cm. Leaves reniform to orbicular 5-20 cm wide, entire, glossy, alternate, long-petioled. Flowers spurred, to 5 cm wide, from orange to white, occasionally red or mahogany; appearing from early summer to ?rst frosts. Distribution South American native, especially Peru and Bolivia. Cultivation Wild. Cultivated widely as an ornamental, and rarely as a drug. Propagated from seed sown in late spring to early summer in rich soil in sunny situation. Dwarf and double-flowered cultivars are found. Some double-flowered forms cannot be raised from seed. Harvest seed before pods lose their green colour. 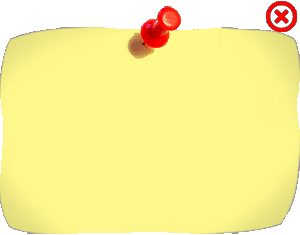 Constituents (seed) A glycoside, glucotropaeoline, which hydrolyzes to yield an antibiotic and an essential oil. Principal action is antibiotic. Uses (fresh leaves, flowers, seeds, pickled flower buds) Antibacterial; antimycotic. Used in infections of the genito-urinary and respiratory systems. Principally employed as a salad herb or as a caper substitute. Used as a garden ornamental. 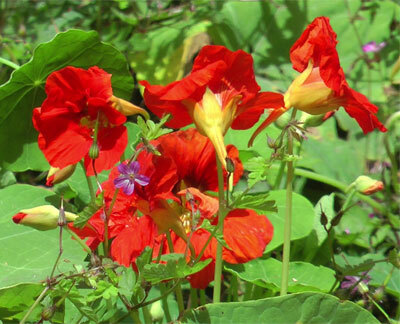 Is it Safe for me to take Nasturtium -Tropaeolum majus - an antibiotic for today Tincture? If you are in any doubt about the possibility Nasturtium tincture causing complications with prescription drugs or a medical condition you may have please get in touch so that we can advise you on the suitability of a particular tincture. There are fewer concerns when using Nasturtium tincture externally and our many years of experience has shown that the tincture is just as effective being applied into the soles of the feet or applied topically on external conditions where they will be absorbed into your system. 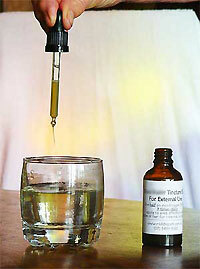 Nasturtium tincture is a potent liquid extract made from organic Nasturtium. It is a concentrated way of getting herbal medicine into your body easily especially applying them to the soles of your feet. Once a tincture is prepared, it has an extremely long shelf life. Tinctures should be kept in a cool, dark cupboard to maintain their potency. If you are on any prescribed medication we strongly advise you to use our free Herbal Tincture enquiry service to make sure that the medication and potent Nasturtium tincture are compatible. How do I prepare my Nasturtium Tincture? When should I drink my Nasturtium Tincture? To store the pesto, the suggestion is to freeze it in ice cube trays so it's ready whenever you need it. The pesto is excellent on top of grilled salmon, halibut, chicken or steak. Just set a pesto ice cube onto each serving and voila, instant gourmet! Nasturtium seeds make a great caper like treat. In fact, they’re called the “Poor Man’s Caper”. Real capers are made from the buds of the caper plant. The poor man’s version is made from the still firm seeds of nasturtium plants. So they start off crisper and tangier. Pour the seeds into a 1 pint canning jar. Bring the vinegar, salt and pepper to a boil and pour over the seeds. Seal, allow to cool then refrigerate the jar and let them mature for about 3 months. Then enjoy! Melt the butter in a stock pot. Add the onion and cook until soft but not browned, stirring occasionally. 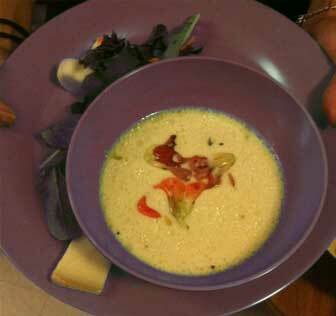 Add the potatoes and nasturtium leaves and continue cooking until the leaves are wilted, about 5 minutes. Add the chicken broth and milk to the stock pot. Add the bay leaf, salt and pepper, then bring to a boil. Cover and simmer gently until the potatoes are tender, about 15 minutes. Serve garnished with fresh nasturtium blossoms. There are more of Brenda’s Nasturtion recipes available at More Nasturtium Recipes. Although it is not an enthusiastic transplantee, it will happily grow in a pot which can be placed in the garden. The Flowers arrive in spring and by the middle of summer the seeds they have dropped will be germinating. By next spring there will likely be a enthusiastic clump of the wonderful plants ready to share your life. This genus of 80-90 species of mostly climbing annuals and herbaceous perennials is native to C and S America. Nastultiums are among the most easily grown hardy annuals. Climbing cultivars cover a fence or bank within a few weeks of germination, and more compact kinds are ideal for summer bedding and containers. Tropaeolum majus was introduced to Europe from Peru in the 16th century by the conquistadors, and was first known as Nasturtium indicum, “Indian cress”, due to its pungent, watercress-like flavour. The species is seldom seen now, having been superseded by a wide range of cultivars. Tropaeolum majus has several properties that make it a useful medicinal and culinary herb. It contains large amounts of sulphur, which reputedly retards baldness, and a glycoside that reacts with water to produce an antibiotic. In addition, the pickled unripe seeds are the only acceptable substitute for capers; they develop capric acid, which gives the characteristic goaty flavour. Tropaeolum minus (dwarf nasturtium) and cultivars of T majus can be used in the same ways as T majus. Tropaeolum is from the Greek tropaion, “trophy”, since the leaves are shaped like round shields, above which are the helmet-like flowers. CULTIVATION Well-drained, moist, average to poor soil in sun. Self-sows freely in some gardens and may be invasive. Rich soil promotes leafy growth at the expense of flowers. Often used in companion planting to deter cucumber beetle and whitefly but it is susceptible to aphid, especially blackfly. Nasturtiums are reputed to deter woolly aphid if plants are grown at the base of apple trees. Prone to viral diseases. Over-winter sterile cultivars in sunny, frost-free conditions. PROPAGATION By seed sown in early_spring at 13-16°C (55-61°F); by basal or stem-tip cuttings in spring and summer (sterile cultivars). HARVEST All parts are picked in summer and used fresh for infusions and tinctures. Plants are also cut for juice extraction. HARDINESS Half hardy to tender, min. 3°C (37°E). PARTS USED Whole plant, leaves, flowers, buds, fruits. PROPERTIES A bitter, antiseptic, tonic herb that has diuretic and expectorant effects, and controls fungal and bacterial infections. MEDICINAL USES Intemally for genito-urinary and respiratory infections, scurvy, and poor skin or hair conditions. Externally for baldness, minor injuries, and skin eruptions. 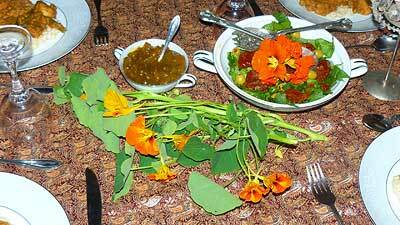 CULINARY USES Leaves, flowers, lower buds, nectar spurs are eaten in salads and sandwiches. Chopped fresh leaves give a peppery flavour to soft cheese or egg dishes. Flowers are used to make vinegar. Unripe fruits are pickled. Ripe seeds are roasted and ground as a seasoning. ECONOMIC USES Combined with Buxus sempervirens (Common Box), Quercus robur (Oak) and Urzica dioica (Hyacinth) in hair lotion. We'd like to introduce you to this wonderful healing herb which is one of nature's most potent antibiotic factorys. 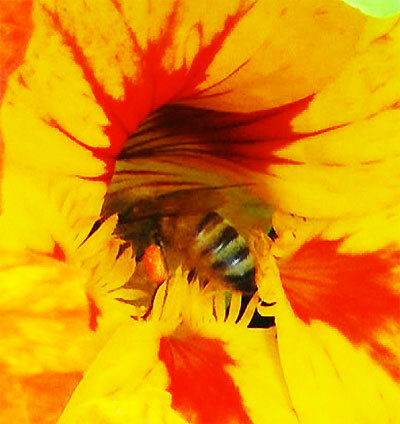 Spring is here and the bees are well into the harvest of the Nasturtiums whose prolific flowers are some of the first to grace the garden. We make medicine, the bees make honey - lovely to be in harmony with nature. The leaves look quite past their best because they have just been through a winter and the plant puts out its flowers before starting to grow new leaves. National Center for Biotechnology Information In vitro study to evaluate the antibacterial activity of a combination of the haulm of nasturtium (Tropaeoli majoris herba) and of the roots of horseradish (Armoraciae rusticanae radix). Published in Arzneimittel-Forschung journal. 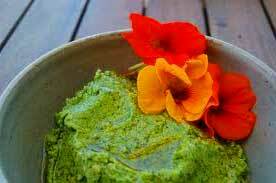 Marion Owen The best-o pesto: Made with nasturtium leaves!